Bring a flying disc and your walking shoes to rustic Brookside Park/Spades Place Park. New visitors to these public lands often find it hard to believe that they are only minutes from the heart of the city. Kessler’s park and boulevard plan called for a lengthy park that straddled Pogue’s Run, one of many tributary creeks to White River. By the time Kessler left city employment, Brookside Park, Spades Place Park, and Brookside Parkway were in use. Brookside Parkway winds its way along the north and south boundaries of the park, providing scenic views to motorists along either bank of Pogue’s Run. Mature trees planted along the parkway drives fulfill Kessler’s vision, making a journey along the parkway enjoyable. Internal drives meander through the wooded park. Spades Place Park includes a significant 1903 filled-spandrel concrete arch bridge designed by Daniel Luten on Nowland Avenue, now an internal drive of the park. Other early concrete bridges span Pogue’s Run within Brookside Park. Set immediately adjacent to Pogue’s Run, Brookside Park has retained its natural rolling hills on the north banks of the creek. Most open ball field areas were installed on the south parcel, where level terrain favored more intensive uses. While Kessler called for a community center building in this park, he did not provide specific designs. The Board of Park Commissioners hired architects Harrison & Turnock to design the Brookside Park Community Center in 1927, completing the park’s facilities. A cascading staircase with broad landings ties the north side of the community center into its naturalistic surroundings. The simple classicism of this building would have pleased Kessler. Today, this park retains many of its historic assets as well as new ones, like a large pool with spray area and a water slide. Brookside Parkway North and South Drives are within Brookside Park/Spades Place Park, which is located at 3500 Brookside Parkway South Dr. on the east side. Reach park personnel at 317- 327-7179 (office) or 317- 327-7331 (pool/seasonal). The park is open to the public dawn to dusk; seasonal activities vary. 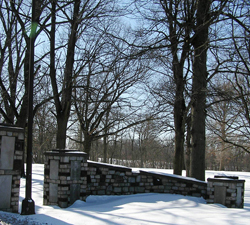 Drive along Brookside Parkway to experience one of the best preserved sections of Kessler designed drives. Parking is available at the community center. Visitors to this park can enjoy a disc golf course, walking/jogging trails, swimming, horseshoes, tennis, baseball, basketball, soccer, football, and picnic shelters. INDYGO bus line from downtown: #11 East 16th St, disembark at Brookside Park stop.